Shafie (middle) inspecting the final preparations for Sunday’s Malaysia Day celebration. KOTA KINABALU: Sabahans should acknowledge Prime Minister Tun Mahathir Mohamad for his contributions in toppling the previous government during the last election. Chief Minister Datuk Seri Shafie Apdal made the statement in light of Mahatir’s return to Sabah to grace the National Malaysia Day Celebration this coming Sunday. “To realize these changes, it cannot be done by Sabah alone. The people in Sabah wanted change. We wouldn’t be able to change without the effort done by Tun Mahathir,” he told reporters when met at the final rehearsal for the Malaysia Day celebration on Friday night. He stressed that there is no ‘hatred’ towards Mahathir among Sabahans. All the people wanted was to overthrow the previous government. “Well it (the hatred) was only towards the then BN Federal Government… there were so many issues during the election but it was not directed to him alone. “It was purely on the (previous) Government of the Day; meaning just the BN government. So that is why we are so happy that we were able to change the government,” Shafie said. When asked why Mahathir had rarely visited Sabah, Shafie said that the decision was done with relevant groups and it was decided that the latter should focus more in West Malaysia. “It is not that he does not want to come here. He (actually) wanted to. But there are people who want him to spend time more in West Malaysia because Umno is stronger there and it is a lot easier to topple BN here,” he said. 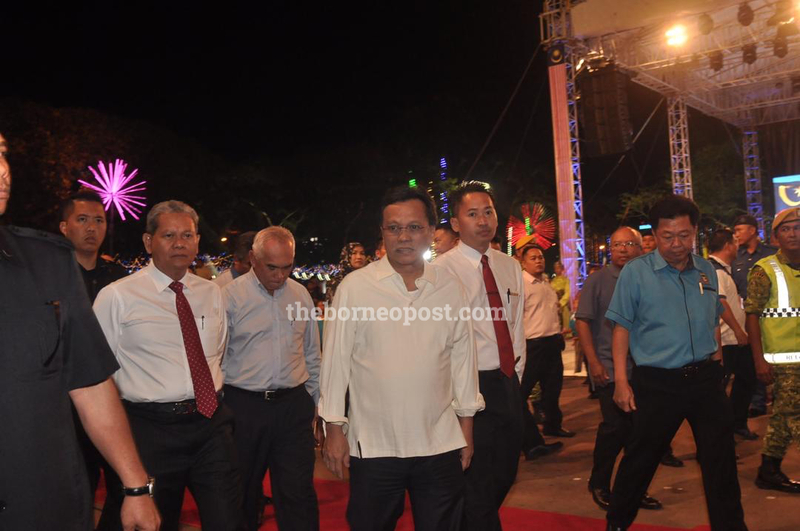 On a separate note, Shafie noted that the final rehearsal for Malaysia Day went. Shafie and Peter posing with some other children who will be performing at the National Malaysia Day Celebration on Sunday. The celebration will be held this Sunday (September 16) at Padang Merdeka. As mentioned, Mahathir as well as other Federal Ministers will be attending the event. disclosed that all preparation work has been completed. This time around, the Malaysia Day celebration will be different as more ethnics and districts will be participating. He described the Malaysia Day celebration for this year is fundamental and meaningful as this would be the first celebration under the leadership of the government.